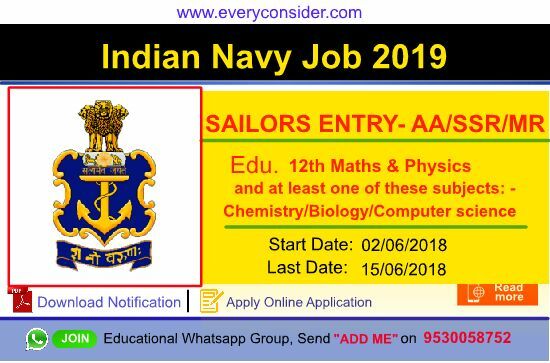 Indian Navy Invites Online Applications From Unmarried Male Candidates For Enrolment As Sailors For Senior Secondary Recruits (SSR) - FEB 2019 Batch Course Commencing February 2019 For SAILORS ENTRY- AA/SSR/MR (CHEF, STEWARD & SANITARY HYGIENIST). we are provide Indian Navy Job details like how to apply indian navy recruitment, भारतीय नौसेना भर्ती, bhartiye no sena bharti, details, Indian Navy Admit card download 2019, Indian Navy Result 2019 etc all details include below article. अभियार्थियो ( अनुसूचित जाती/ अनुसूचित जनजाती उम्मीदवारों को छोड़कर, जिन्हें परीक्षा शुल्क के भुगतान से मुक्त किया गया है) को परीक्षा शुल्क 106 रूपए हैं, अभियार्थी परीक्षा शुल्क नेट बैंकिंग, क्रेडिट कार्ड, डेबिट कार्ड, या युपीआई के माद्यम से भुगतान कर सकता है. भारतीय नौ सेना भर्ती ऑनलाइन आवेंदन 2 जून से 2018 से 15 जून 2018 तक भरे जा सकते है, आप निचे दी गई लिंक से आवेदन कर सकते है. Upload your Image and Sign. Pay Fee through Net Banking, Debit Card, Credit Card or UPI. Take Print of Application and Payment Receipt.